the profiler that measures the most flatness/levelness indices, using the most extensive standard software package in the industry. The Dipstick model 2277 is better than ever. The new computer screen is much easier to read in the sun (easier to read than your mobile phone). The screen is larger, so the graph of each profile is larger and easier to analyze. The computer has no keyboard. It’s been replaced by a virtual keyboard, so there is no worry about the keyboard getting wet from rain or perspiration. You can upgrade your Dipstick 2272 to the Dipstick 2277 for only $1,995.00 – or even less. Some recent Dipstick 2272 buyers will receive big discounts on the $1,995.00 upgrade price – some will get the upgrade for free. Email or call us (our contact info is to the right) and we will generate a customized upgrade quotation. The best performance and low cost are two reasons that Dipstick is used and specified in 66 countries by clients including the world’s biggest company and retailer, the World Bank, the World Road Association. Dipstick was selected for the construction of the world’s tallest building and to measure the flattest and most level superflat slab ever constructed. It’s been 40 years since The Face® Companies started developing what became modern concrete floor flatness/levelness technology. After building the first reliable floor flatness/levelness measuring device (the Face Floor Profileograph) and developing the placement and finishing techniques that resulted in what Face called “Superflat floors,” a team of Face Companies engineers and flat floor consultants invented the Dipstick and introduced it at the 1982 World of Concrete. Ever since, the Dipstick has been the gold standard for the measurement of concrete floor and pavement profiles. it’s the only profiler that instantly produces reports, graphs, line surveys and 3D surface studies. 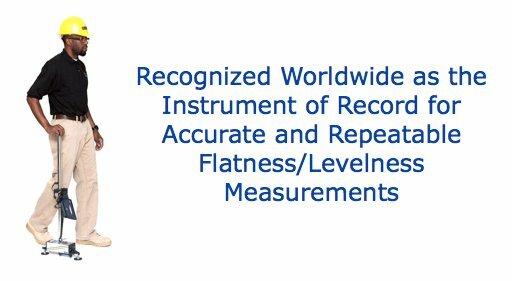 Why is the Dipstick the Most Specified Flatness/Levelness Measuring Instrument in the World? Testing labs, building owners, developers, contractors, universities, research institutions and government agencies on six continents choose the Dipstick because it produces the most accurate and repeatable flatness/levelness data – period. Dipstick readings are guaranteed to be accurate to 0.0125 mm – less than 0.0005″ (that’s 5/10,000ths of an inch!). Based on the thorough testing of every unit we manufacture, Dipsticks are typically accurate to 0.005 mm (0.0002″)… that’s 7.5 times more accurate than the 2016 advertised claims of any other device. The F-Numbers measured can only be as accurate as the device measuring them. No other instrument comes close. Why? Constant design and electronic improvements in an ongoing effort to improve what is already unparalleled performance. Although it looks the same, the Dipstick of today doesn’t include a single component that was part of the Dipstick of 20 years ago. In fact, the Dipstick is so accurate that it’s routinely used to calibrate other measuring instruments! Data & Graphs Now… On-site! Only the Dipstick instantly calculates F#s and instantly produces graphs, reports and 3D surface studies on-site. The Dipstick operates at up to 1,200 readings per hour … the fastest way to the right answer… the true measure of economical operation. Measure, analyze and report combined F-Numbers for a 10,000 sq.ft. (1,000 square meter) slab in 30 minutes or less! Measure American Concrete Institute / ASTM FF & FL (Random Traffic) and Fmin (Defined Traffic). With the rolling instruments on the market, you can’t measure Fmin at all. With another device, you have to pay extra software rental fees to measure Fmin. Dipstick calculates Fmin… with at least three to ten times the accuracy of its competitors… for free. Because we sell so many instruments, the purchase price of the Dipstick is less than some other profilers, even though Dipsticks are the highest quality instrument – even coming with their own custom color computer! But, when you figure in the costs of maintaining your profiler once you’ve bought it, over its lifetime, a Dipstick can cost 40% to 75% less than other profilers. Dipstick features the most complete software package on the market – with free life-of-the-instrument software upgrades – something no one else offers. Only Dipstick has proven to produce accurate data for 15 years or more. Who knows if other profilers will even be on the market in 15 years? Dipstick is manufactured and serviced by the company that developed F-Numbers – with clients in 66 countries – a company that has been in the construction industry for almost 150 years. With Dipstick, there’s No Expensive and Inconvenient Annual Recalibration. With other profilers, you can pay $500 to $1,000 or more every year in calibration fees and the shipping costs back and forth. That means you’ll pay $7,500 to $15,000 or more in extra costs over the life of those instruments. For customers outside North America, those extra costs could easily double to $15,000 or $30,000 in recalibration fees, high international shipping costs (in both directions) and the costs of clearing customs again and again. Moreover, with those other profilers, while you’re paying the extra fees and the round trip shipping costs, you will also lose the use of the instrument for weeks or months at a time while it’s being calibrated and shipped back and forth. Watch the Dipstick Precision, Accuracy and Repeatability video above to see the performance of six different Dipsticks – up to nine years old – that had never been recalibrated. You can easily check the calibration of your Dipstick yourself. This process is described in the Dipstick Operator’s Manual. Each Dipstick kit is shipped in its own customized ZERO® aluminum carrying case, which is sized to fit into overhead storage compartments on most commercial aircraft. Our expert technicians are available by telephone each business day to answer your questions about F-Number measurement, floor flatness and levelness, the many applications of Dipstick Profilers and to provide any other technical help that you may need. The great majority of callers on our technical assistance lines are helped immediately. With other companies, you might wait days for technical help. We have more technical and service personnel than all of our competitors combined. With the Dipstick, you won’t have to wait weeks for your new, upgraded or repaired instrument. Why Don’t The Face Companies Sell a Rolling Floor Profiler? We get this question from time to time. The truth is the first rolling device ever made to measure concrete floor profiles was developed by The Face Companies in the late 1980s and early 90s. We wanted it to be a “quick check” profiler for contractors to estimate their FF numbers. But our rolling device never produced repeatable data. Each time we measured the same line, we got different F-Numbers. The FFs would vary by 10% or so. The FLs would change by as much as 25% each time we measured the same line. We decided not to sell the product because the quality of the data it produced didn’t meet our standards. The rolling profilers on the market suffer from the same problems we had 20 years ago, as a third-party comparison of Dipstick and the leading rolling profiler revealed. For instance, rolling devices have wheel slippage and they jostle as they are manually pulled… or mechanically driven… across the floor. These problems throw off the profiler’s reading of both the surface conditions and the distance it travels. That hurts the F-Number calculation. They also have problems when they roll over even tiny debris on the floor such as grains of sand… which act like micro speed bumps for the profiler’s hard wheels. That introduces more errors in the profile measurement. It doesn’t take many errors… even tiny mistakes… to make the F-Numbers reported unreliable… particularly the FLs. Others have recognized this reality. One rolling profiler doesn’t even try to measure FL. It reports only an FF number. And there are other problems: Rolling devices can’t deal with real-world problems like joints, sawcuts, rebar and other surface discontinuities. Dipstick walks right over them. In addition, rolling devices can’t measure forms… and better forms are the key to better FLs. Dipstick is perfect for this, too. Some people think rolling devices are “faster.” But, if they’re used so as to minimize the effect of the errors in data collection, they’re no faster than the Dipstick. But really, what is the advantage of a “faster” profiler that produces different data each time it measures the same line? What good are data that you can’t count on? Have any Model 2000, 2200 or 2272 Dipstick? Now’s the time to Upgrade to a Model 2277.
or email Dipstick@FaceCo.com for details. © 2019 Face® Construction Technologies, Inc.